Perhaps nothing is more gratifying for cosmetic patients than having an immediate correction of rhytides or scars as a result of the injection of a dermal filler. 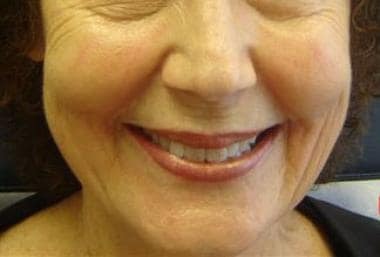 Before and after photos of patients who have had injection of dermal fillers are shown below. Patient 1. Before photo. Left cheek. Patient 1. After photo. Left cheek. Patient 1. Before photo. Right cheek. Patient 1. After photo. Right cheek. Since its approval in 1981, bovine collagen had been the only US Food and Drug Administration (FDA)–approved dermal filler more than a decade. Quickly, this dermal filler gained popularity and was marketed under the name Zyderm I. This dermal filler was found to be extremely effective for the correction of fine lines and shallow scars, with results often lasting 3 months. 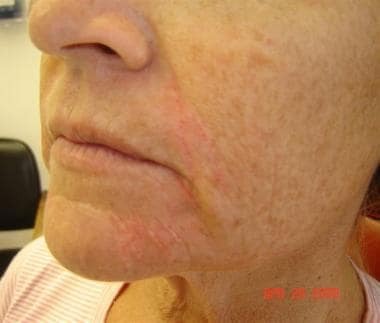 Moderate rhytides, deeper nasolabial folds, and marionette lines could be treated using Zyderm I with fair results, but results often did not last more than 2 months. What became clear is that Zyderm I had 3 major shortcomings: (1) the potential for allergy to the bovine collagen, which required skin testing prior to the first treatment; (2) results generally lasted 3 months or less; and (3) disappointing results if used to fill moderate rhytides, skin folds, or scars. Two years later, Zyderm II and Zyplast were FDA approved and introduced into the market, to address the latter 2 shortcomings of Zyderm I. These newer dermal fillers, Zyplast in particular, significantly improved overall results for deeper rhytides and folds and these dermal fillers, for more than a decade, remained the only dermal fillers that were FDA approved for use in the United States. 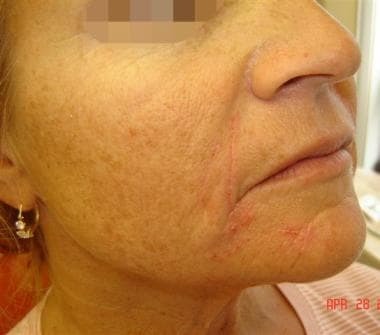 Despite this, the need for most patients to have frequent treatments, the need for new patients to undergo skin allergy testing prior to treatment, and the limitations of the treatment of deeper rhytides and folds, the full potential for dermal fillers was not seen until the recent addition of newer dermal fillers to the armamentarium. The perfect dermal filler would be inexpensive, safe, painless to inject, hypoallergenic, and long lasting. In addition, it should have consistent and predictable results, feel natural under the skin, take little time to inject, be ready-to-use, exert no downtime on the patient, and have a low risk of complications. With the increasing desire for people to achieve a more youthful appearance, the aging baby boomer population, and the increased demand for "lunch-time procedures," the pharmaceutical market has responded by providing the cosmetic surgeon with an increasing number of options to meet the demands of the cosmetic patient. Thus, this segment of cosmetic surgery has been the fastest growing for the past decade. By definition, a dermal filler is a product that is injected or placed into the dermis. Patients are instructed to not manipulate the treated areas, because the product may shift. The best way to reduce inflammation is to immediately apply a cool pack to the areas that were treated. In current practice, several dermal fillers are available for use in the United States, in addition to subdermal fillers, or those that are placed underneath the dermis in the subcutis. This article primarily addresses the dermal fillers that are FDA approved for use in the United States. Nonanimal, animal, and synthetic dermal fillers are mentioned in the article. Cadaveric-derived dermal fillers and implants are not mentioned because they are costly, not all of them are FDA approved, and they are used more frequently for burn victims. In May 2015, the FDA issued a warning to healthcare providers and the public about serious complications that can occur if dermal fillers are inadvertently injected into blood vessels in the face. The complications could possibly include vision impairment, blindness, stroke, and damage and/or necrosis of the skin and underlying facial structures. Caution should be used to ensure proper placement of the filler material, and patients should be informed about the potential adverse effects and how to recognize symptoms of impending serious complications. Hyaluronic acid is the most prominent glycosaminoglycan in the skin. Hyaluronic acid potently binds to water and, when injected into the skin, volumizes, softens, and hydrates the skin. In addition to these benefits, it plays a role in cell growth, membrane receptor function, and adhesion. Hyaluronic acid stabilizes intercellular structures and produces the viscoelastic network for collagen and elastin fibers to bind together. As seen with photoaging, these connections fail, thus resulting in disorganized clumps of collagen and elastin. These benefits make hyaluronic acid an excellent dermal filling agent. [3, 4] In February 2003, the FDA approved Restylane, a cross-linked, nonanimal source hyaluronic acid. This dermal filler was quickly found to be relatively long lasting, have minimal adverse effects, was easy to use, was ready to use out of the box, did not require refrigeration, was cost effective, and did not require skin testing prior to treatment. Because hyaluronic acid is identical in all species, the risk of allergy is remote. Hyaluronic acid has a heparinlike effect, thus resulting in a greater incidence of bruising than is seen with collagen fillers. Until 2010, nearly every FDA-approved hyaluronic acid product in the United States did not contain lidocaine, thus significantly increasing the discomfort experienced with injection of these dermal fillers compared with the bovine- and human-derived collagen fillers. Despite these shortcomings, hyaluronic acid fillers still emerged as the leader of dermal filling agents for soft tissue augmentation, owing to their superior cosmetic results. Restylane was approved by the FDA in 2003 for the treatment of nasolabial folds. This dermal filler is produced by fermentation in bacterial cultures of equine streptococci. This dermal filler contains approximately 100,000 particles per mL (20 mg/mL). These particles are approximately 300 mm and are highly cross-linked (single cross-linked) using an ether bond, making these dermal fillers one of the stiffest hyaluronic acid fillers. This dermal filler has been used for correction of the nasolabial folds, marionette lines, tear troughs, and glabellar frown lines, in addition to lip enhancement and cheek augmentation. Other clinical uses include correction of the jowls and nasal deformities. In general, most patients can expect 6 months of correction, if not longer. In 2010, Restylane-L became available, which contains lidocaine to reduce pain upon injection. 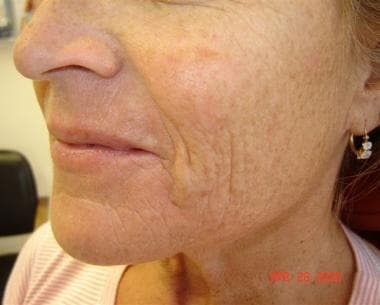 Before and after photos of Restylane injection are shown below. Patient 2. After photo. Dr. Bader injected Restylane (1 mL) into the nasolabial folds. This dermal filler was originally marketed as Perlane-L, but had a name change in 2015. Restylane Lyft is identical to Restylane except that it consists of larger gel particles. This dermal filler is suitable for the correction of deeper folds, such as the nasolabial folds, and works well for cheek enhancement. Additionally, some experienced physicians prefer this dermal filler over Restylane for lip augmentation. Most patients can expect 6-12 months of correction with Perlane. In 2010, Perlane-L became available, which contains lidocaine to reduce pain upon injection. Before and after photos of Perlane injection are shown below. Patient 7. After photo. 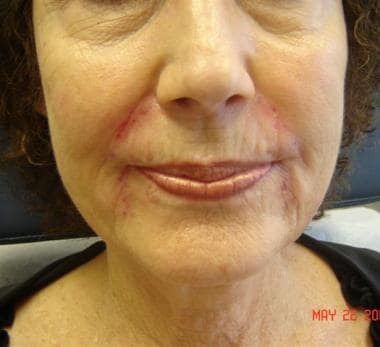 Dr. Bader injected Perlane (1 mL) into nasolabial folds, upper and lower lips, and marionette lines. Patient 7. After photo. Side view. This dermal filler was FDA approved in 2014 for submucosal implantation for lip augmentation and dermal implantation for correction of perioral rhytids in patients older than 21 years. It has the same concentration of hyaluronic acid and a of pH 7.0 as the other Restylane products, but the molecules are smaller. This product is intended to be used for fine perioral lines, although other areas on the face can be treated as well. Medium-sized particles of stabilized hyaluronic acid generated by streptococcal bacteria and formulated to a concentration of 20 mg/mL and suspended in a physiological buffer at a pH of 7.0. Adds natural volume as it integrates into the dermal tissue; then, attracts and binds water molecules to help maintain volume. Mid-to-deep dermal implantation for correction of moderate-to-severe facial wrinkles and folds, such as nasolabial folds; submucosal implantation for lip augmentation in patients older than 21 years. Supplied in a disposable glass syringe; each syringe contains 0.4 mL, 1 mL, or 2 mL gel for injection into mid dermis. 20 mL/60 kg (130 lb) body mass per year. Hyaluronic acid chemically cross-linked with BDDE, pH = 7.0 and concentration of 20 mg/mL; largest fraction of gel particles size is 940-1090 µm. Adds natural volume as it integrates into the deep dermal tissue or subcutis; then, attracts and binds water molecules to help maintain volume. Implantation into deep dermis to superficial subcutis for correction of moderate-to-severe facial folds and wrinkles, such as nasolabial folds, or in patients older than 21 years who have age-related volume loss. Supplied in 1-mL glass syringes for injection; injected into mid-to-deep dermis. Restylane Silk Same hyaluronic acid concentration as Restylane, but composed of smaller gel particles and contains 0.3% lidocaine. Same as above. Submucosal implantation for lip augmentation and dermal implantation for correction of perioral rhytids in patients older than 21 years. Same as above. Approximately 6 months. Same as above. 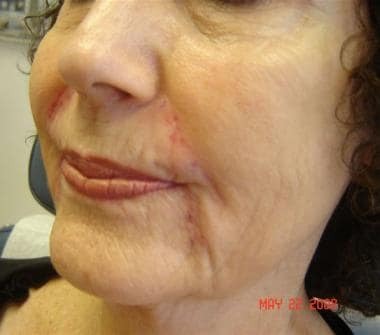 In 2006, the FDA approved Juvederm, which is also a nonanimal stabilized hyaluronic dermal filler. In the United States, three types of Juvederm dermal fillers are FDA approved. Both Juvederm Ultra and Juvederm Ultra Plus contain 24 mg/mL of hyaluronic acid, but Juvederm Ultra Plus has a higher proportion of cross-linking than Juvederm Ultra. Juvederm is a homologous gel with the highest degree of cross-linking of any of the hyaluronic acid fillers and thus has a smooth consistency. Juvederm Ultra and Juvederm Ultra Plus have indications similar to those of Restylane and Perlane, respectively, and also do not require refrigeration or skin tests prior to use. In 2010, both Juvederm Ultra and Juvederm Ultra Plus became available with lidocaine, to reduce pain with injection, both labeled as Juvederm (R). Sterile, biodegradable, nonpyrogenic, viscoelastic, clear, colorless homogenized gel implant; cross-linked hyaluronic acid formulated to a concentration of 24 mg/mL suspended in a physiological buffer; hyaluronic acid is produced by Streptococcus equi bacteria. Juvederm Ultra XC contains 0.3% lidocaine. Adds natural volume as it integrates into dermal tissue; then, attracts and binds water molecules to help maintain volume. Mid-to-deep dermis for correction of moderate-to-severe facial wrinkles and folds (eg, nasolabial folds); Juvederm Ultra XC is indicated for injection into the lips and perioral area for lip augmentation in adults older than 21 years. One box contains 2 prefilled syringes, each containing 0.8 mL of hyaluronic acid; inject into mid dermis. 24 mg/mL of hyaluronic acid (same as above) but with a higher proportion (11%) of cross-linked hyaluronic acid. Juvederm Ultra Plus XC contains 0.3% lidocaine. Same as above. Injected into mid-to-deep dermis. 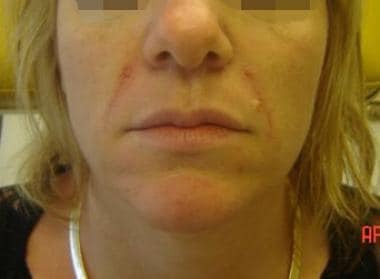 Juvederm Voluma XC 20 mg/mL of cross-linked hyaluronic acid and 0.3% w/w lidocaine in a physiologic buffer. Adds natural volume as it integrates into the subcutis; then, attracts and binds water molecules to help maintain volume. Deep (subcutaneous and/or supraperiosteal) injection for cheek augmentation to correct age-related volume deficit in the mid face in adults older than 21 years. Injected subdermally or above the periosteum. Approximately 9-12 months. 20 mL/60 kg (130 lb) body mass per year. These dermal fillers have precautions similar to those of Restylane and Perlane. Additionally, because this dermal filler is derived from an avian (bird) source, persons with a known allergy to avian proteins should not be treated with these dermal fillers. The Hylaform dermal fillers are stored at room temperature and no skin test is required before use. 5.5 mg/mL medium-sized particles of hylan B, which is a sterile, nonpyrogenic, viscoelastic, clear, colorless gel implant composed of cross-linked molecules of hyaluronan or hyaluronic acid; hyaluronan is a naturally occurring polysaccharide of the extracellular matrix in human tissues, including skin. Injected into dermal tissue to provide space-occupying viscoelastic supplement for the extracellular matrix of connective tissue; this viscoelastic supplementation or augmentation of dermal tissue results in temporary correction of skin contour; binds water to skin to enhance volume. Wrinkles, creases, and lines caused by facial expression or aging. Medium-depth wrinkles and fine lines. Same hylan B concentration as Hylaform but composed of larger particles. Deep furrows and enhancing lip volume. This dermal filler is identical to Hylaform except that it is derived from a bacterial source through fermentation. This dermal filler is slightly stiffer than Hylaform. Captique is stored at room temperature and no skin test is required before use. Same as Hylaform but derived from a bacterial source through fermentation. Bacterial origin renders this dermal filler slightly stiffer than Hylaform, but it can be injected similarly to Hylaform and Hylaform Plus. This dermal filler contains 20 mg/mL of bacterially derived hyaluronic acid. The particle size is approximately 200 mm, which is slightly smaller than Restylane, and is double–cross-linked with both ether and ester bonds. Ester bond linkages make this dermal filler more stable, protecting the ether bonds, and they are hydrophobic, thus making the product less susceptible to breakdown by hyaluronidase. 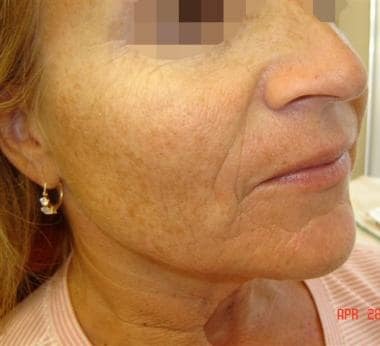 Pilot studies have shown that this dermal filler may be degraded more slowly than Restylane, although larger studies are needed to confirm this. This dermal filler has indications and precautions similar to those of Restylane. Hyaluronic acid with the benefit of added anesthetic; not FDA approved in the United States at this time. This dermal filler was FDA approved for use in the United States in 2008 and was the first hyaluronic acid dermal filler to contain lidocaine, which reduces pain upon injection. Prevelle Silk is indicated for the treatment of moderate-to-severe facial wrinkles, although it may be better suited for fine lines. Injection into the mid-to-deep dermis is recommended by Mentor, the manufacturer. Similar to other hyaluronic dermal fillers, the most common adverse effects include temporary injection site reactions such as swelling, pain, tenderness, redness, lumps, and bumps. Colorless hyaluronic acid gel with lidocaine; most recent FDA approval (May 2008). Moderate-to-severe facial lines, folds, and wrinkles. Because this product contains bovine collagen, skin testing must be performed prior to treatment, as would be indicated with Zyderm or Zyplast (see Collagen). Because results are permanent, it is often best not to try to achieve full correction in one session, but to accomplish the desired result over several treatment sessions. In addition to allergy, other adverse effects may include lumpiness, persistent swelling or redness, and increased sensitivity at the injection site. The product must be refrigerated. Composed of PMMA microspheres (diameter 30-50 μ m) suspended in a water-based carrier gel containing 3.5% purified bovine collagen, 92.6% buffered isotonic water for injection, 0.3% lidocaine hydrochloride, 2.7% phosphate buffer, and 0.9% sodium chloride. Microspores provide permanent volume for wrinkle correction. FDA approved for correction of nasolabial folds. Lip volumizing contraindicated. Aseptic product that has an opaque, off-white appearance and is supplied in a sealed tray containing 5 syringes (3 with 0.8 mL, 2 with 0.4 mL); must be brought to room temperature prior to use; 26-gauge needle is used; best cosmetic result achieved by moving needle back and forth 2-3 times beneath each skin fold being treated, while maintaining constant pressure throughout implantation procedure; do not overcorrect because result is considered permanent. Permanent support structure for wrinkle correction. Safety of injecting more than 3.5 mL per treatment site or 8.9 mL overall not established. Because poly-L-lactic acid is not a true filler, but relies on neocollagenesis to achieve clinical improvement, the clinical results from this agent are less predictable than the true dermal fillers. Patients should be properly educated that results take 4-6 weeks to be appreciated. Dermal nodules have been reported after treatment and often take 7 months or much longer to develop. When treating the face, these nodules can often be felt, but not seen. Reconstitution of the product with 6 or more milliliters of sterile water, in addition to vigorous posttreatment massage, is believed to reduce the incidence of nodule formation. Use of this product on the hands has increased; however, unfortunately, the incidence of nodules in this location may be as high as 10% and the nodules are often visible, unsightly, and difficult to treat. In this location, treatment with Sculptra reconstituted with as much as 10 mL of sterile water has still resulted in nodule formation, which may take 1-3 years to appear after treatment. Additional long-term studies are needed to fully assess the safety of poly-L-lactic acid for the treatment of the hands in an immune-competent individual. No skin test is required prior to treatment. The product is stored at room temperature, although it must be reconstituted prior to treatment. Synthetic, biodegradable, biocompatible, immunologically inert polymer from the alpha-hydroxy-acid family; must be reconstituted with at least 3-5 mL of sterile water for injection; must stand for at least 2 hours to ensure hydration prior to treatment. Particles of poly-L-lactic acid stimulate formation of new collagen (collagen neosynthesis) in the skin, adding volume over time. Intended for restoration and/or correction of the signs of facial fat loss (lipoatrophy) in people with HIV infection; in immune-competent people, used as a single regimen for correction of shallow-to-deep nasolabial fold contour deficiencies and other facial wrinkles in which deep dermal grid pattern (cross-hatch) injection technique is appropriate. Supplied as a sterile, freeze-dried preparation for injection in a clear glass vial; to be injected into the deep dermis or subcutaneous layer. Volume should be limited to approximately 0.1-0.2 mL per each individual injection; the volume of product injected per treatment area varies depending on surface area to be treated. This novel filler, Radiesse, was FDA approved in December 2006 for the correction of facial wrinkles and folds and for the correction of HIV-associated facial atrophy. In 2009, it received FDA approval for cosmetic use in non-HIV patients as well. The subdermal filler is composed of 30% calcium hydroxylapatite and 70% carrier gel. The clinical results may last as long as 12 months or longer, although the carrier gel lasts no longer than 6 months, thus often resulting in a slight decrease in correction by that time. Radiesse is nearly always injected subdermally at the dermal-subcutaneous junction or just above the periosteum; thus, this product is not a true dermal filler. Studies from 2008 suggest that calcium hydroxylapatite may induce neocollagenesis, although further research is needed. Most commonly, Radiesse is used for the correction of nasolabial folds, atrophic cheeks, and temporal wasting. Because of the pain associated with injection, some practitioners added lidocaine to the syringe, without a clinical appreciable decrease in effect. Mariano Busso, MD,  had treated numerous patients by adding 1 drop of 10% lidocaine to the previously available 1.3-mL syringe of Radiesse to decrease the discomfort associated with injection. In 2010, Radiesse with lidocaine was released to reduce pain upon injection and no premixing is needed. Treatment of the hands has been accomplished with the addition of 0.15-0.23 mL of 2% lidocaine per 1.3-mL syringe of Radiesse. This can be accomplished using a nose-to-nose (female-to-female) Luer-lock connector to connect the syringe of Radiesse to a 3-mL syringe containing the lidocaine. At least 10 passes of the product back and forth between the two syringes is recommended to achieve adequate and even distribution of the lidocaine. This makes the consistency of the Radiesse slightly thinner, thus making it easier to spread when using a bolus injection technique. Similarly, this mixture is often preferred for the treatment of the temples. Injection into the dermis may result in nodule formation and should be avoided. Extreme care must be taken to avoid injection while withdrawing the needle out of the skin, which will result in the deposition of material into the dermis. Treatment of the lips has resulted in cyst formation containing the carrier gel. For this reason, most cosmetic surgeons avoid treating the lips with Radiesse. No skin test is required prior to treatment, and the product is stored at room temperature. cellulose; Radiesse (1.5 mL, 0.8 mL) has a calcium hydroxylapatite particle size range of 25-45 μ m and should be injected with a 25- to 27-gauge needle. Stimulates formation of new collagen (collagenesis) in the skin, adding volume over time. Subdermal implantation for restoration or correction of signs of facial fat loss (lipoatrophy) in people with HIV infection; also for subdermal implantation for correction of moderate-to-severe facial wrinkles and folds, such as nasolabial folds. Supplied as 1.5-mL or 0.8-mL syringe; insert needle with bevel down at approximately 30° angle to skin; needle should slide under the dermis to the point where the injection should begin; advance the needle into the subdermis to the starting location; slowly inject material in linear threads, while withdrawing needle, until desired level of correction is achieved. Approximately 1 year, although the gel carrier is lost by 6 months, causing depreciation of initial results. Amount injected varies depending on site and extent of restoration or augmentation desired. Use a 1:1 correction factor. No overcorrection needed. Azficel-T (laViv) is an autologous aesthetic cell therapy indicated to improve the appearance of moderate-to-severe nasolabial fold wrinkles in adults. The product is available from Fibrocell Science, Inc, a company focused on developing personalized cell therapies for aesthetic, medical, and scientific applications. According to the company, creating azficel-T involves a patented technology whereby fibroblasts are extracted from behind the patient's ear and sent to the Fibrocell Science laboratory, where they are multiplied for about 3 months and are then frozen until needed. Only physicians who complete a Fibrocell-approved training program will be able to administer it. This is a biological that works over time that provides gradual and natural results. On the basis of investigators' and patients' assessments, a significantly greater proportion of patients demonstrated a positive response to treatment with azficel-T than with placebo. The treatment improved the appearance of nasolabial fold wrinkles for the 6 months of patient follow-up after the last treatment. The company said studies are ongoing, looking at how long beyond 6 months after the last treatment the effect may last. In clinical trials, the most common adverse events were mild-to-moderate injection-site reactions that usually resolved within 1 week. Cultured fibroblast cells obtained autologously are confirmed to contain collagen and suspended to form injectable biological as dermal filler. Following injection, the cultured fibroblasts are thought to synthesize new extracellular matrix and/or to stimulate remodeling of existing tissue components, thereby altering the structure, texture and appearance of the skin at injection site. Indicated to improve the appearance of moderate to severe nasolabial fold wrinkles. Manufacturing process for takes approximately 11-22 weeks after receipt of the patient’s biopsy samples by the manufacturer; each vial contains ~18 million autologous fibroblasts/1.2 mL. Six months, but possibly longer. Inject 0.1 mL ID per linear centimeter into the nasolabial fold wrinkles. During the initial consultation, address the patient’s desires in detail, which should include the exact location of desired correction, duration of correction desired, expected degree of correction with treatment, expected duration of correction, and the potential adverse effects of treatment. Imperatively, communicate the limitations of treatment, including the degree of correction and the longevity, with the patient prior to treatment. Additionally, some patient’s will request that the physician use less dermal filler than is recommended due to cost. In this circumstance, fully communicate the reduction of the degree of improvement that will be seen prior to treatment, because this frequently results in an unsatisfied patient. As with any cosmetic procedure, receiving informed consent and having effective communication with the patient prior to treatment is paramount. Two separate but related reports from 2017 and 2018 have reaffirmed the risks, some very serious—including strokes and blindness—that can be associated with dermal fillers. A 3-year study (2014-2016) reported swelling, infection, blindness (8 cases), and tissue death as the most common problems. A 10-year analysis (2007-2017) reported nodule formation, infection, inflammation, allergic complications, and vascular complications as the most common problems. Narins RS, Brandt FS, Lorenc ZP, Maas CS, Monheit GD, Smith SR. Twelve-month persistency of a novel ribose-cross-linked collagen dermal filler. Dermatol Surg. 2008 Jun. 34 Suppl 1:S31-9. [Medline]. Brooks M. Dermal Fillers May Rarely Cause Serious Injury, FDA Warns. Medscape News & Perspective. Available at http://www.medscape.com/viewarticle/845528?nlid=81904_1584&src=wnl_edit_medp_derm&uac=106950CX&spon=33. May 28, 2015; Accessed: June 5, 2015. Lupo MP. Hyaluronic acid fillers in facial rejuvenation. Semin Cutan Med Surg. 2006 Sep. 25(3):122-6. [Medline]. Sundaram H, Cassuto D. Biophysical Characteristics of Hyaluronic Acid Soft-Tissue Fillers and Their Relevance to Aesthetic Applications. Plast Reconstr Surg. 2013 Oct. 132(4S-2 Clinical Introduction to the Hyaluronic Acid Dermal Filler Using Cohesive Polydensified Matrix Technology):5S-21S. [Medline]. Homicz MR, Watson D. Review of injectable materials for soft tissue augmentation. Facial Plast Surg. 2004 Feb. 20(1):21-9. [Medline]. Lambros V. The use of hyaluronidase to reverse the effects of hyaluronic acid filler. Plast Reconstr Surg. 2004 Jul. 114(1):277. [Medline]. Cassuto D, Sundaram H. A Problem-Oriented Approach to Nodular Complications from Hyaluronic Acid and Calcium Hydroxylapatite Fillers: Classification and Recommendations for Treatment. Plast Reconstr Surg. 2013 Oct. 132(4S-2 Clinical Introduction to the Hyaluronic Acid Dermal Filler Using Cohesive Polydensified Matrix Technology):48S-58S. [Medline]. Dover JS, Carruthers A, Carruthers J, Alam M. Clinical Use of RESTYLANE. Skin Therapy Lett. 2005 Feb. 10(1):5-7. [Medline]. Hirsch RJ, Narurkar V, Carruthers J. Management of injected hyaluronic acid induced Tyndall effects. Lasers Surg Med. 2006 Mar. 38(3):202-4. [Medline]. Rao J, Chi GC, Goldman MP. Clinical comparison between two hyaluronic acid-derived fillers in the treatment of nasolabial folds: hylaform versus restylane. Dermatol Surg. 2005 Nov. 31(11 Pt 2):1587-90. [Medline]. Monheit GD, Prather CL. Juvéderm: a hyaluronic acid dermal filler. J Drugs Dermatol. 2007 Nov. 6(11):1091-5. [Medline]. Flynn TC, Thompson DH, Hyun SH. Molecular Weight Analyses and Enzymatic Degradation Profiles of the Soft-Tissue Fillers Belotero Balance, Restylane, and Juvéderm Ultra. Plast Reconstr Surg. 2013 Oct. 132(4S-2 Clinical Introduction to the Hyaluronic Acid Dermal Filler Using Cohesive Polydensified Matrix Technology):22S-32S. [Medline]. Ballin AC, Cazzaniga A, Brandt FS. Long-term efficacy, safety and durability of Juvéderm® XC. Clin Cosmet Investig Dermatol. 2013. 6:183-9. [Medline]. [Full Text]. Kono T, Kinney BM, Groff WF, Chan HH, Ercocen AR, Nozaki M. Randomized, evaluator-blind, split-face comparison study of single cross-linked versus double cross-linked hyaluronic acid in the treatment of glabellar lines. Dermatol Surg. 2008 Jun. 34 Suppl 1:S25-30. [Medline]. US Food and Drug Administration. Device Approval. US Department of Health and Human Services. Available at http://www.FDA.gov. Accessed: June 15, 2008. Alam M, Gladstone H, Kramer EM, Murphy JP Jr, Nouri K, Neuhaus IM, et al. ASDS guidelines of care: injectable fillers. Dermatol Surg. 2008 Jun. 34 Suppl 1:S115-48. [Medline]. ArteFill - Instructions for Use [package insert]. San Diego, Calif: Artes Medical, Inc. 2008. Available at [Full Text]. Lemperle G, Romano JJ, Busso M. Soft tissue augmentation with artecoll: 10-year history, indications, techniques, and complications. Dermatol Surg. 2003 Jun. 29(6):573-87; discussion 587. [Medline]. Butterwick K. Understanding injectable poly-L-lactic acid. Cosmet Dermatol. 2007. 20:388-92. Vleggaar D. Soft-tissue augmentation and the role of poly-L-lactic acid. Plast Reconstr Surg. 2006 Sep. 118(3 Suppl):46S-54S. [Medline]. Cohen JL. Understanding, avoiding, and managing dermal filler complications. Dermatol Surg. 2008 Jun. 34 Suppl 1:S92-9. [Medline]. Coleman KM, Voigts R, DeVore DP, Termin P, Coleman WP 3rd. Neocollagenesis after injection of calcium hydroxylapatite composition in a canine model. Dermatol Surg. 2008 Jun. 34 Suppl 1:S53-5. [Medline]. Berlin AL, Hussain M, Goldberg DJ. Calcium hydroxylapatite filler for facial rejuvenation: a histologic and immunohistochemical analysis. Dermatol Surg. 2008 Jun. 34 Suppl 1:S64-7. [Medline]. Busso M, Voigts R. An investigation of changes in physical properties of injectable calcium hydroxylapatite in a carrier gel when mixed with lidocaine and with lidocaine/epinephrine. Dermatol Surg. 2008 Jun. 34 Suppl 1:S16-23; discussion S24. [Medline]. azficel-T (laViv) [package insert]. Fibrocell Science, Inc. 2011. Available at [Full Text]. Kunjur J, Witherow H. Long-term complications associated with permanent dermal fillers. Br J Oral Maxillofac Surg. 2013 Aug 17. [Medline]. Doheny K. Dermal Fillers: The Risks to Eliminating Wrinkles. Medscape News & Perspectives. Available at https://www.medscape.com/viewarticle/894549#vp_1. March 28, 2018; Accessed: April 2, 2018. Murray CA, Zloty D, Warshawski L. The evolution of soft tissue fillers in clinical practice. Dermatol Clin. 2005 Apr. 23(2):343-63. [Medline]. Lowe NJ, Maxwell CA, Patnaik R. Adverse reactions to dermal fillers: review. Dermatol Surg. 2005 Nov. 31(11 Pt 2):1616-25. [Medline]. Patient 1. After photo. Dr. Bader injected CosmoDerm I (1 mL) into the nasolabial folds, oral commissure, and chin. Patient 3. Before photo with smile to accentuate the areas of correction. Patient 3. After photo. Dr. Bader injected CosmoDerm I (1 mL) into the glabella, lips, and crow's feet. Patient 4. After photo. 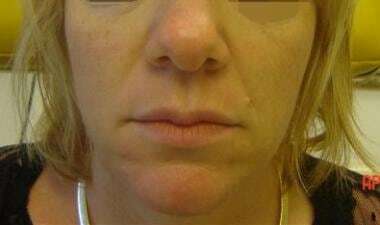 Dr. Bader injected Restylane (0.4 mL) into the nasolabial folds, chin, and oral commissure. Patient 5. After photo. Dr. Bader injected Restylane (1 mL) into the nasolabial folds, chin, and oral commissure. Patient 6. Dr. Bader injected CosmoDerm I (1 mL) into the nasolabial folds, upper and lower lips, left cheek, and lateral crow's feet (bilaterally).